Stella is one of the three Extended pilots from the Phantom Pain under the command of Neo Roanoke. 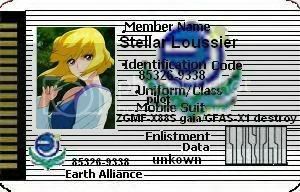 Together with her comrades Sting Oakley and Auel Neider she infiltrates the PLANT colony Armory One and, with the help of some ZAFT-soldiers, they steal three new Gundam-type mobile suits. Stella becomes the pilot of the ZGMF-X88S Gaia. Stella and her comrades heavily damage the base inside the colony and fight against Shinn Asuka, who is piloting the ZGMF-X56S Impulse. During the battle, it becomes clear that when someone mentions the word “die,” Stella goes into a state of shock. 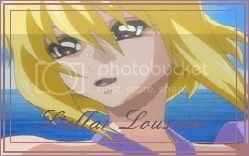 Stella, Sting, and Auel manage to escape from the base on the Mirage Colloid-equipped ship Girty Lue, but are pursued by the ZAFT-battleship Minerva. After the “Break the World” incident, Stella and Phantom Pain are stationed on Earth on the EA carrier John Paul Jones and Stella is later engaged in another battle with Shinn. Login or register to add (*...STeLLy...*) as your friend!